What we have to say, what you want us to hear. That’s how our blog works. It’s interactive. Let’s learn together. “We believe that every successful new application built today will be an intelligent application,” says Soma Somasegar, venture partner at Madrona Venture Group and former head of Microsoft’s Developer Division. Indeed, we are in a transition period where the barriers to entry in Machine Learning are going down dramatically. And at the same time, more individuals and businesses are seeing the potential of Machine Learning to improve existing products and services and to enable completely new applications. 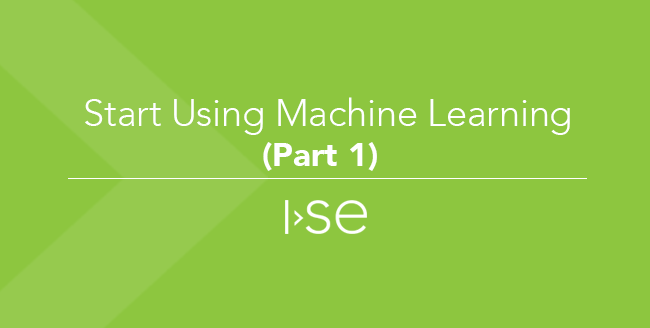 The time is now for both software developers and businesses of any size to start using Machine Learning to create more powerful user experiences and bring new ideas to the marketplace. 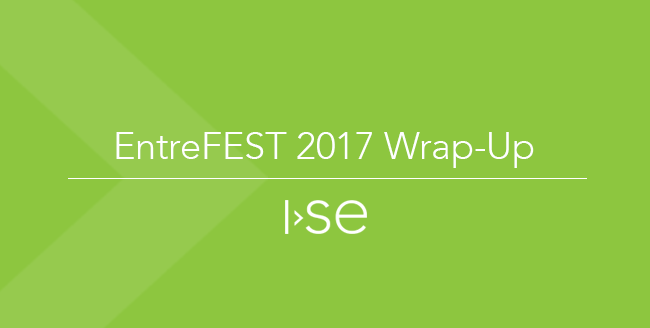 It's been a few weeks now since EntreFEST 2017 took over downtown Iowa City with the largest gathering of Iowa's entrepreneurial and innovation community. I was there to connect with like-minded people and get energized alongside fellow innovators. I was also there to speak to entrepreneurs about how to capitalize on trends in Artificial Intelligence and Machine Learning to create more engaging experiences for their customers. This conference did not disappoint: I met a lot of fantastic people that are pouring their energy into new ideas with great potential, I rekindled old friendships, and I learned new things from some top-notch speakers. So with the conference now behind us, and some time to process it all, I thought I'd share some of my takeaways. If you were using email in the early 2000’s, you may remember it was around that time that spam was becoming a serious problem. Think of roughly 80% of your email being unsolicited garbage from unprincipled marketers and con artists. Imagine having to sort through that on your own, every day. There were various attempts at addressing the problem, and it was around 2002 that Machine Learning techniques started to be applied to identify and filter out spam. Over the years more sophisticated Artificial Intelligence techniques have been applied, such that the difficult, yet indispensable task of spam filtering is done for us, executed pretty well, and is nearly invisible to us. 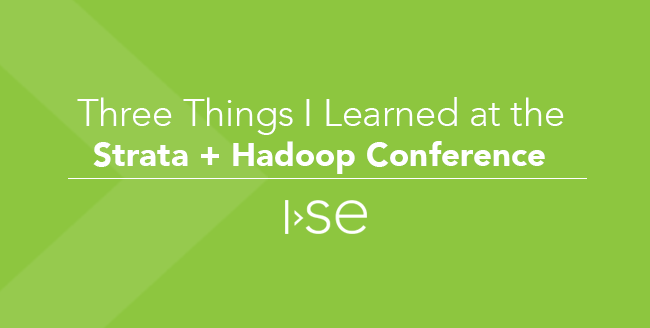 Two weeks ago, Matt Coventon, ISE’s Big Data Practice Lead, and I went to New York City for three days to attend the annual Strata + Hadoop Big Data Conference. If you are not familiar with it, Strata + Hadoop World is the largest Big Data conference of its kind. The conference brings together data scientists, software engineers, innovators, executives, and software providers who want to explore and learn more about the latest emerging data technologies. I am a relative newbie when it comes to Big Data, so my objective was to go and learn as much as I could about the market and the technologies. What If We Didn't Have to Run Those 4 Miles? Why Does Everyone Want Me to Download Their App? ISE delivers innovative, end-to-end, scalable IOT and telematics solutions, enterprise mobility applications and tailored software solutions that help companies simplify and solve even their most complex business challenges. Delivering Excellence, Providing Opportunities! Join a company with an award-winning culture where you can collaborate with the best and the brightest while working with emerging technologies! 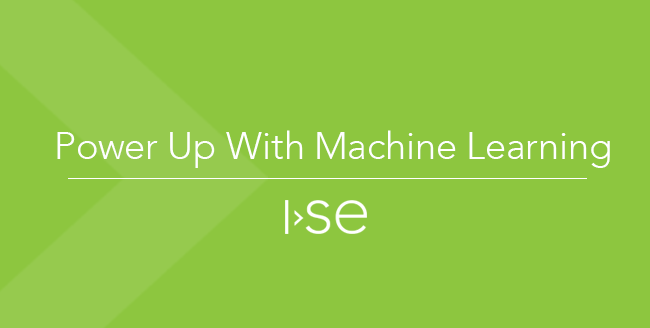 Join the ISE Team!